Here's a project that's been all over pinterest lately. 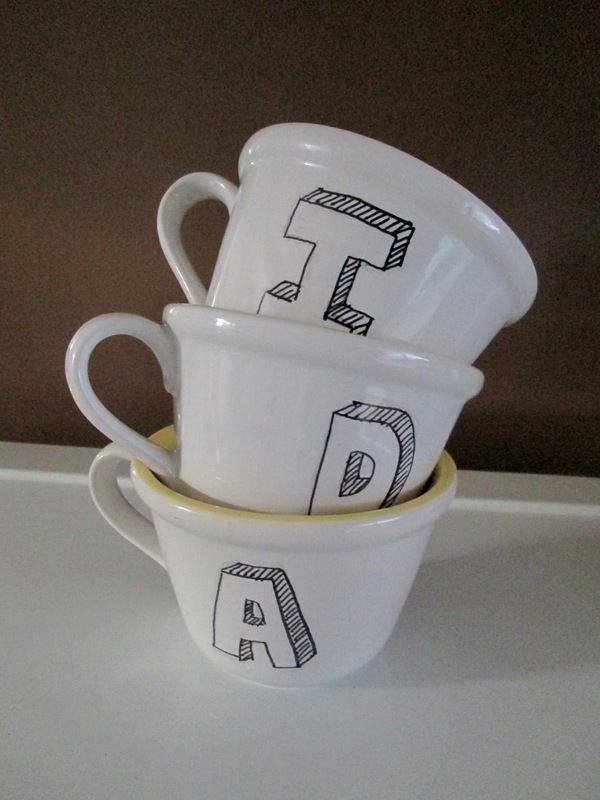 Draw over your mugs, bowls, cups or whatever with a Sharpie marker and bake in the oven at 350 degrees Fahrenheit for 30 minutes. Baking makes the ink permanent. I don't know if a different marker may be used because I haven't tried any other brand. Obviously, you could draw any image you want. I chose to write the first letter of our names using some sort of freehand 3D font. These, by the way, are the mugs that I recently bought for P12.00 each at our latest trip to Uniwide. We found cheaper mugs selling for P10.00 but I really love how the insides are colored yellow (I have been into yellow since 2006!). I feel kind of iffy about the marker coming into contact with food or beverage so I wouldn't use it for the insides of mug. I cannot deny though how i love this easy project is so much. Had there been any more plain mugs left I would have used them all! these will make really nice gifts!